KIEV, Ukraine -- Venezuelan President Hugo Chavez was in Ukraine on Monday for talks on aerospace cooperation, the Interfax news agency reported. Chavez was scheduled to meet with Ukrainian President Viktor Yanukovych, and later tour the Antonov aircraft assembly plant in the capital Kiev. Ukraine is keen to find buyers for Antonov, a producer of cargo and passenger aircraft. 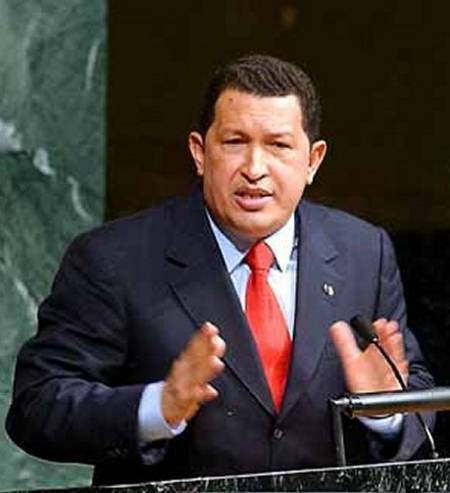 Chavez was is on a two-week international trip devoted to increasing trade between Venezuela, and European and Middle Eastern nations. The visit to Ukraine is his first. Over the weekend, Chavez met with Belarusian President Aleksander Lukashenko that saw the signing of an agreement on oil. The deal will see Venezuelan crude transported to the landlocked former Soviet republic via a pipeline running across Ukraine from the Black Sea, for the first time giving Belarus an alternative to importing oil from Russia. Chavez was in Russia last week for talks with the Kremlin on possible arms deliveries to Venezuela, and possible construction of a nuclear power plant in Venezuela by Russian engineers. The Venezuelan leader is scheduled to travel onwards from Ukraine to Iran, Syria and Portugal.